spacemal I am currently working on an chronology/article covering the construction and testing of the lunar module and seek some help in obtaining some images of certain articles. Does anyone have some images of; TM-2 (often confused for LTA-8) and, PA-1, PD-1 (or PD-2) the propulsion test rigs used at White Sands? Also, would welcome any articles about LM testing at WSMF. Any help greatly appreciated. Sixteen test models were used in the lunar module development program. 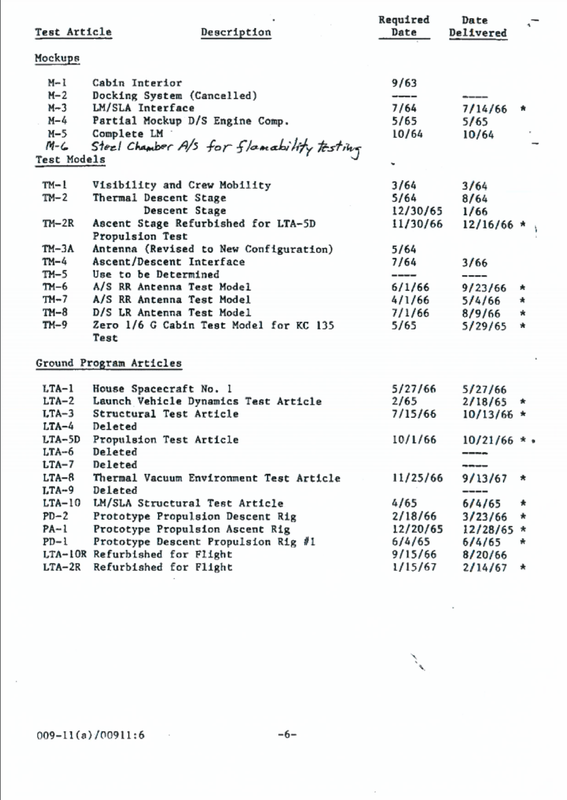 Most of the test models were specialized for specific investigations and were not complete ascent and descent stage configurations. These models were used for such things as crew visability and mobility studies (TM-1), radio frequency tests (TM-3), pyrotechnic studies of ascent/descent stage separation (TM-4), lightweight descent stage landing studies and stowage reviews (TM-5), rendezvous radar antenna tests (TM-6 and TM-7), landing radar tests (TM-8), reaction control system plume impingement tests (TM-9), battery installation thermal tests (TM-13), docking tunnel tests (TM-14), descent stage thermal tests (TM-15 and TM-17), and descent stages structural tests (TM-16). spacemal Strange it does not include TM-2. It was used for early thermal vacuum tests and had similar "stripped" appearance to LTA-8, hence the frequent confusion, but it was different in its basic form, such as the skin over the APS fuel tank. There is a small picture of it in Apollo Chronology volume 4, page 51.
spacemal Also good picture of TM-2 in Joshua Stoff's book "Building Moonships: The Grumman Lunar Module," although it is wrongly stated as being LTA-8 (page 78). paulj I am asking this on behalf of collectSPACE member spacemal. Does anyone know the origin, i.e. document, of the following page please? If so, do you have a copy of doc to share? I'm trying to finish a chronology of the LM. Thank you.